A couple of years ago, Hurco introduced a software based motion control system called UltiMotion. 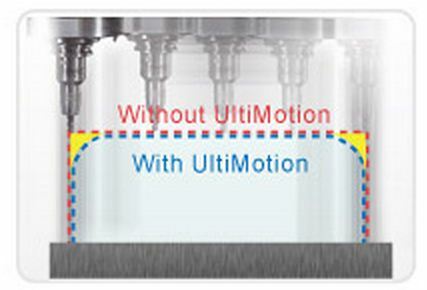 UltiMotion offers a variable block lookahead - which allows the control to see up to 10,000 blocks into the future when necessary, and can produce both greatly improved surface finishes, as well as reductions in cycle times of up to 30% - especially on the more complicated toolpaths where more look-ahead is needed. On simpler cutter paths the control will require far less look-ahead, which means more of the control’s RAM memory is freed up and can be better utilized for other things. Controls that don’t have this unique ability to “adapt” to the current needs of the control, aren’t able to re-purpose any of the available control RAM memory, and can’t benefit from this sort of variability. Although there are many types of parts that can benefit from UltiMotion, some parts will enjoy more of the benefits than others - parts with contours consisting of many directional changes in the toolpath, parts with lots of holes, and any cutter toolpath with higher feedrates are perfect candidates for UltiMotion. Programs with increased feedrates on complex contours is a perfect scenario where the variable block lookahead can really shine, and can really make a huge difference in machine performance, and in cycle time reductions. When drilling holes, UltiMotion blends the sharp corners created at the end of each of the moves between holes - which allows for much faster transitions between the points. This spherical motion means that the linear axis will begin moving before the Z axis has fully reached its commanded point…effectively rounding (or blending) the corner, and eliminating the traditional pause in motion usually created when changing directions…and tapping retracts can be programmed up to 10 times that of the programmed tapping feedrates. UltiMotion can also help to increase the overall life of the machine tool itself and prolong machine accuracy. The advanced algorithm of the software inherently creates smoother motion and eliminates the stopping, jerking, and banging that is often associated with high speed machining – all of which can negatively impact internal machine components like ballscrews and linear guides.